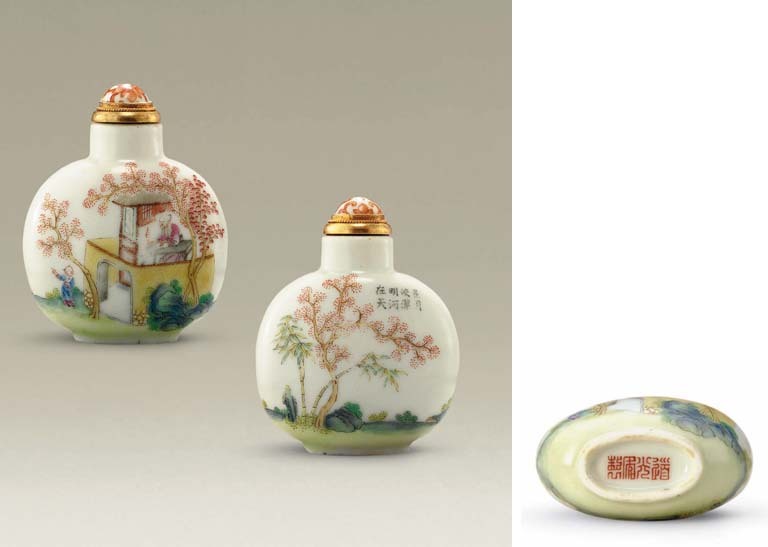 Enameled porcelain bottles of the Daoguang period are characterized by a wide range of subject matter, among which many are narrative in character. The design on this bottle was a standard Imperial type for the period, depicting a scholar burning the midnight oil. Three others of this design but of varying shapes remain in the Imperial Collection in Beijing; see Snuff Bottles, The Complete Collection of Treasures of the Palace Museum, nos. 336, 339 and 362. See also one in H. Moss, Snuff Bottles of China, no. 300; one in D. Low, More Treasures from the Sanctum of Enlightened Respect, no. 173; and one from the Kardos Collection.